So now I can finally use Carbide to do this. Also found another use for it, as I show in the video I have done. At the mark you made, remember that stone height should be 3/4"
Then proceed to do the negative relief, point. And end with making the heels of the length that suits you best. All i get when I click on the item is "Invalid Attachment" ??? Me too ,I get the same ,but its mentioned to inform the administrator. What is the "V" angle on it ? Joacim emailed the photos and I placed them on the server. They should be working now. a fabulous tutorial . even without text, the fotos clearly show how to achieve your grind. i would think this to be quite valuable to many engravers. thank very much for taking the time to share this !!!!!!! Please experiment with the temple, so perhaps you will find something that is not I done. What is the "V" angle on the template ? Sorry SE if I do not understand what you mean, but v-angle be made on the tip is 96 degrees if that's what you think. the video is very good. it shows a great possibility for those wanting to do inside rings. thanks for taking time to show this. 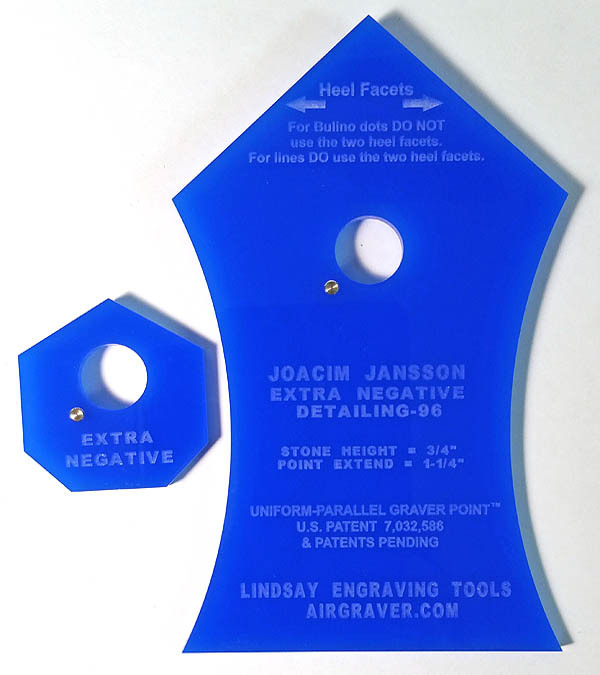 I would like to ask can one use Jocim's small template on 1/2" bench-stone height to taper the sides of gravers, if yes the template can put straight left and right side on the graver? I have seen in the video it takes the corners off at 3/4" assuming it will do the same at 1/2" I have requested for one. Hello Joacim, Thanks for this graver as I have begun experimenting with it and I like the control you get with it for inside rings. It takes a little getting used to because of being used to holding the graver in a higher angle but with a bit of practice it is another great tool in the arsenal. I do not quite understand what you mean SEngraver? But you can not use the 1/2 height, to get the sides tapperd. it must be 3/4. You will understand when you try. I'm glad to hear that you like it. it offers many new opportunities. But the most happy I am to have a Carbide graver that works for engraving inside the rings nowadays, this temple makes it possible.